Power steering (if equipped) Power steering uses energy from the engine to assist you in steering the vehicle. • Never hold the steering wheel against a stop (extreme right or left turn) for more than 5 seconds with the engine running. Holding the steering wheel for more than 5 seconds in either position may cause damage to the power steering pump. • If the power steering drive belt breaks or if the power steering pump malfunctions, the steering effort will greatly increase. If the vehicle is parked for extended periods outside in cold weather (below - 10 °C /14 °F), the power steering may require increased effort when the engine is first started. This is caused by increased fluid viscosity due to the cold weather and does not indicate a malfunction. When this happens, increase the engine RPM by depressing the accelerator until the RPM reaches 1,500 rpm then release or let the engine idle for two or three minutes to warm up the fluid. Tilt steering (if equipped) A tilt steering wheel allows you to adjust the steering wheel before you drive. You can also raise it to the highest level to give your legs more room when you exit and enter the vehicle. WARNING - Steering wheel • Never adjust the angle of steering wheel while driving.You may lose your steering control and cause severe personal injury or accidents. To change the steering wheel angle, pull down (1) the lock release lever, adjust the steering wheel to the desired angle (2), then pull up the lock-release lever to lock the steering wheel in place. Be sure to adjust the steering wheel to the desired position before driving. 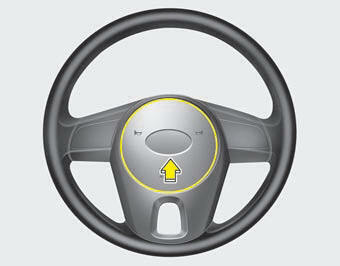 • To sound the horn, press the area indicated by the horn symbol on your steering wheel (see illustration). The horn will operate only when this area is pressed. • Do not strike the horn severely to operate it, or hit it with your fist. Do not press on the horn with a sharp-pointed object.